by Hamblin, W. Kenneth, Howard, James D.
Comments: BRAND NEW W/FAST SHIPPING! 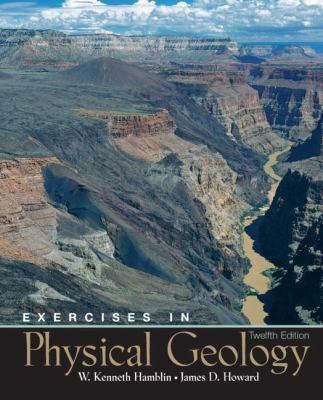 This item is: Exercises in Physical Geology, 12th Ed., 2005, by Hamblin, W. Kenneth^Howard, James D; FORMAT: Spiral Bound; ISBN: 9780131447707. Choose Expedited for fastest shipping! Our 98%+ rating proves our commitment! We cannot ship to PO Boxes/APO address. To avoid ordering the wrong item, please check your item's ISBN number! Hamblin, W. Kenneth, Howard, James D.
This is the twelfth edition of this laboratory manual, which was first published in 1964. During the intervening 40 years, our knowledge of the forces that shape our planet has grown exponentially. The revolutionary theory of plate tectonics is firmly established and provides a framework for learning about Earth's dynamics and the interrelationships between moving tectonic plates, mountain building, the origin of ocean basins, and the evolution of continents. New technology permits us to see Earth from space, image the ocean floor, and measure directly the motion of tectonic plates. We can see in one synoptic view the surface of an entire continent and map ocean currents, temperatures, and vegetation from satellites orbiting in space. During no other period has there been so much exploration and development of new knowledge about Earth. For this reason, we have revised this manual in an attempt to incorporate the new theories and discoveries. The objectives we set forth in the first edition still stand: To give students experience in examining geologic data and formulating hypotheses to explain observed facts. To provide an opportunity to continue laboratory-type work outside of class so students can prepare adequately for lab sessions and review work independently. To give laboratory instructors maximum latitude in their instruction by providing abundant material from which they can select for their own specific objectives. NEW TO THIS EDITION The most important change in this edition is the significant expansion of the introductory sections to each exercise, making the exercises more self-sufficient and less reliant on outside textual references or teacher instruction. You will notice that the manual is longer than in previous editions; this is due to the additional background information. Every exercise has been carefully updated and checked for accuracy. In addition, we have focused on the quality of the questions, rewording and refining them for clarity. Continuing a trend developed over previous editions, we have made extensive use of new computer-generated shaded relief maps, new photographs, and new remote-sensing images. We have, however, retained many of the classic maps and aerial photographs that have served effectively as standard exercises for many years. Rocks and Minerals Most of the photographs of rocks and minerals are the same as those used in the previous edition, but some have been replaced where photographs of better specimens were obtainable. This material is intended as reference material for comparison with laboratory specimens. Photographs, of course, can never replace study of actual hand specimens, but they are useful as a guide and reference in the study of physical properties of minerals and textures of rocks. Maps, Aerial Photographs, and Remote Sensing Images Maps, aerial photographs, and various types of remote sensing images are the fundamental tools of geologic research and are naturally the basic materials in laboratory work of physical geology. The advances in geology during the last several decades have brought about profound changes in the making of maps. As a result of the space program, we now have sophisticated satellite imagery of Earth's surface and radar images that can "see through" clouds and vegetation cover. With remote sensing, we can also see the detailed landscape of the ocean floor and recognize features as small as a submerged boat. We can observe what was once unseen, and we can view the surface features of our planet from exciting new perspectives. Landsat images of Earth can be enhanced by the computer--enlarged, manipulated in tone and color, and even reconstructed to produce stereoscopic images. In addition, most of the United States has been photographed with high-altitude infrared photography, and radar images have been made of large areas of North America. These excitinHamblin, W. Kenneth is the author of 'Exercises in Physical Geology', published 2004 under ISBN 9780131447707 and ISBN 013144770X. Loading marketplace prices 18 copies from $37.08 How does the rental process work?